Dr. Bettina Reitz-Joosse from the Faculty of Arts impressed the jury by her interactive mini lecture on the meaning of words and texts, and they unanimously awarded her with the much-desired title of UG Lecturer of the Year. Malvina Nissim has been elected University of Groningen Lecturer of the Year 2016. The Assistant Professor Computational Linguistics at the Faculty of Arts was awarded both the Jury Prize and the Audience Award on Education Day. 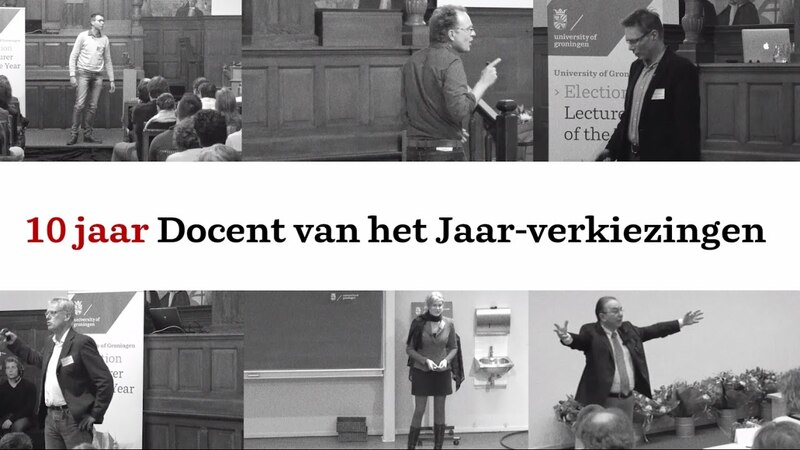 Dr. Barend van Leeuwen of the Faculty of Law received most votes in the internet election and thus won the Web Award. Prof. Niels Taatgen has been elected University of Groningen Lecturer of the Year 2015. The professor of Cognitive Modelling at the Faculty of Mathematics and Natural Sciences was awarded the Jury Prize on Education Day. The Audience Award was won by Dr Erin Wilson of the Faculty of Theology and Religious Studies, and Dr Riemer Vegter of the Faculty of Medical Sciences/UMCG received most votes in the internet election and thus won the Web Award. Prof. Anton Scheurink, Professor of Neuroendocrinology at the Groningen Institute for Evolutionary Life Sciences, has been elected University of Groningen Lecturer of the Year 2014. Scheurink won the Jury Award and the Audience Award and also received the most votes in the internet elections, making him the winner of the Web Award as well. Christian Zuidema, Assistant Professor Spatial Planning, has won the Jury Prize in the Lecturer of the Year Elections. Zuidema also won the Audience Award. Hans Burgerhof, lecturer Medical Statistics, gained the most votes via the website and was awarded the Web Award. Justin Kroesen, Lecturer in the Art History of Christianity, was the winner of the jury prize of the Lecturer of the Year Election 2012. Physiologist Bert Otten won both audience awards. Laura Batstra of the Faculty of Behavioural and Social Sciences was the winner of the Lecturer of the Year Award 2011. The Audience Award and the Web Award went to Francesco Picchioni (Faculty of Mathematics and Natural Sciences). The Lecturer of the Year Award 2010 went to Dr Rob den Otter of the UMCG / Faculty of Medical Sciences. Den Otter also won the Audience Award, based on the votes of the attending audience. The Web Award was won by Dr Jaap Wieringa of the Faculty of Economics and Business. Jan-Willem Romeijn of the Faculty of Philosophy was the winner of the Lecturer of the Year Award 2009. The Web Award was won by human movement scientist Gert-Jan Pepping (Faculty of Medical Sciences / UMCG). Kees de Vey Mestdagh (Faculty of Law) received most of the audience's votes and thus the Audience Award. Prof. Geurt Henk van Kooten of the Faculty of Theology and Religious Studies was declared winner by the expert jury of the University of Groningen Lecturer of the Year Award 2008. The Audience Award went to Prof. Wilbert Kolkman of the Faculty of Law. The very first University of Groningen Lecturer of the Year Award went to Prof. E.J.A. Scherder (Faculty of Medical Sciences / UMCG). Starting in 2016, the annual prize for the Lecturer of the Year, € 7,500, has been donated by the COWOG Fund. The complete Lecturer of the Year programme can be followed live via the internet. Students and lecturers can vote for their preferred nominee via the University website. Last modified: 12 April 2019 4.43 p.m.